Field Trips - Where to Go? I like to take students on a field trip after testing and before the end of the year. We used to be able to just schedule a field trip to a park, play or museum without anyone questioning it. In recent years we have been asked to fill out long forms detailing how the trip is educational, and what activities we plan to complete before and after the field trip to enhance the experience. I do agree that field trips should be educational but sometimes the experience of going somewhere new is an educational experience in itself. Aquariums or zoos are fabulous to get children excited about biology. What kid doesn't love learning about exotic animals? 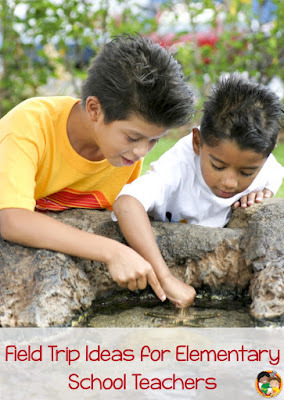 Science centers or museums offer programs and exploration time. It is easy to fill up a day at one of these locations. Many also offer iMax movies or planetarium shows. Plus as a bonus you can go rain or shine! I hate it when my carefully planned trip gets ruined by rain. What kind of field trip can you go on to support literacy? Take a trip to the children's theater. Once we went to see the BFG after using the book as a read aloud. It was one of my favorite field trips ever. The play was fantastic. Some historical sites provide living history presentations, have free or low cost programs, and offer crafts like candle making. If you teach in the city, you may consider taking your students to a park or nature center to expose them to a natural environment. If you live near a state or federal park, forest, grassland, seashore or monument call and see what they offer for field trips. One of these sites near me does not charge admission and provides a free program. All we have to pay for is our transportation. You can't beat it. What is your favorite field trip location? Leave a comment below.